Recently Haas et al. (J Neurophysiol 96: 3305–3313, 2006), observed a novel form of spike timing dependent plasticity (iSTDP) in GABAergic synaptic couplings in layer II of the entorhinal cortex. Depending on the relative timings of the presynaptic input at time t pre and the postsynaptic excitation at time t post, the synapse is strengthened (Δt = t post − t pre > 0) or weakened (Δt < 0). The temporal dynamic range of the observed STDP rule was found to lie in the higher gamma frequency band (≥40 Hz), a frequency range important for several vital neuronal tasks. 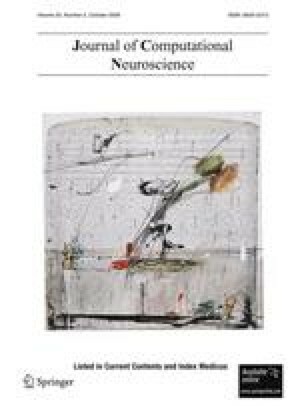 In this paper we study the function of this novel form of iSTDP in the synchronization of the inhibitory neuronal network. In particular we consider a network of two unidirectionally coupled interneurons (UCI) and two mutually coupled interneurons (MCI), in the presence of heterogeneity in the intrinsic firing rates of each coupled neuron. Using the method of spike time response curve (STRC), we show how iSTDP influences the dynamics of the coupled neurons, such that the pair synchronizes under moderately large heterogeneity in the firing rates. Using the general properties of the STRC for a Type-1 neuron model (Ermentrout, Neural Comput 8:979–1001, 1996) and the observed iSTDP we determine conditions on the initial configuration of the UCI network that would result in 1:1 in-phase synchrony between the two coupled neurons. We then demonstrate a similar enhancement of synchrony in the MCI with dynamic synaptic modulation. For the MCI we also consider heterogeneity introduced in the network through the synaptic parameters: the synaptic decay time of mutual inhibition and the self inhibition synaptic strength. We show that the MCI exhibits enhanced synchrony in the presence of all the above mentioned sources of heterogeneity and the mechanism for this enhanced synchrony is similar to the case of the UCI. This work was performed under the sponsorship of the Office of Naval Research (Grant N00014-02-1-1019) and the National Institute of Health Collaborative Research in Computational Neuroscience program (1R01EB004752).